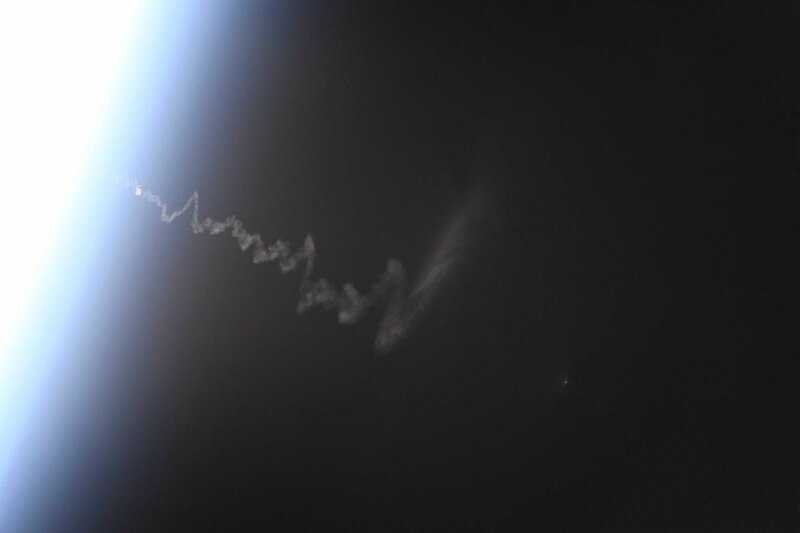 Supplies on the way: Canadian astronaut David Saint-Jacques snapped this photo of a Russian cargo spacecraft&apos;s zigzag launch trail from the International Space Station this morning (April 4). The space station passed over the Baikonur Cosmodrome launch site 38 seconds after a Soyuz rocket launched the Progress 72 spacecraft into orbit, according to NASA spokesperson Rob Navias, giving Saint-Jacques an early glimpse of its Progress spacecraft headed their way. And Saint-Jacques and his five crewmates didn&apos;t have long to wait — the Progress 72 spacecraft was the second cargo launch to undertake a special ultra-fast delivery, getting its cargo to the station after just two orbits, or 3.5 hours after liftoff. Progress cargo launches, and crewed Soyuz launches, can take up to two days to reach the station; their previous "fast track" would get there in six hours, with four Earth orbits. Roscosmos&apos; first two-orbit rendezvous happened in July 2018, with the Progress 70 launch. Today&apos;s spacecraft carries about 3.7 tons of supplies for the space station crew, including 104 lbs. (47 kilograms) of oxygen and air; 926 lbs. (420 kg) of water; 3,117 lbs. (1,413 kg) of spare parts and other gear; and 3,375 lbs. (1,530 kg) of propellant. The spacecraft docked with the station at 10:25 a.m. EDT (1425 GMT), and will remain at the station for about 3 months. It heralds a busy month for Saint-Jacques and his crewmates: NASA astronauts Anne McClain, Christina Koch and Nick Hague, as well as Russian cosmonauts Oleg Kononenko and Alexey Ovchinin. The cargo craft carries additional supplies for an April 8 spacewalk, currently scheduled for Saint-Jacques and McClain, and the crew will welcome both a Northrop Grumman Cygnus spacecraft and a SpaceX Dragon spacecraft full of cargo later this month.